Last year's tsunami + nuclear disaster in Japan is one of those stories you'd rather skip over when you read the paper. Isn't it over yet? Don't they have it under control? Can't we move on to the next crisis? Please, please, purty please? Japan is leaning toward a policy of halving nuclear power's share of electricity supply from pre-Fukushima levels to about 15 percent by 2030, but will likely stop short of pledging the long-term exit strategy that many voters favour, experts said. That would be a victory of sorts for a nuclear industry that has been under fire since a huge earthquake and tsunami devast[at]ed the Fukushima atomic plant in March 2011, triggering meltdowns in the world's worst radiation accident in a quarter century. For the first time, scientists have detected radioactivity in fish that have migrated into California waters from the ocean off Japan, where radiation contaminated the sea after explosions tore through the Fukushima nuclear reactors last year. The evidence is "unequivocal" that the tuna - caught off San Diego a year ago - were contaminated with radiation from Japan's nuclear disaster, the researchers said. In an unusually stark warning, Japan’s prime minister during last year’s nuclear crisis told a parliamentary inquiry on Monday that the country should discard nuclear power as too dangerous, saying the Fukushima accident had pushed Japan to the brink of "national collapse." In testimony to a panel investigating the government’s handling of the nuclear disaster, the former prime minister, Naoto Kan, also warned that the politically powerful nuclear industry was trying to push Japan back toward nuclear power despite "showing no remorse" for the accident. "Gorbachev said in his memoirs that the Chernobyl accident exposed the sicknesses of the Soviet system," Mr. Kan said, referring to the 1986 explosion of a reactor in Ukraine, which spewed radiation across a wide swath of Europe. "The Fukushima accident did the same for Japan." As I've written before, Satisfying energy requirements of a culture built on massive distribution of goods across the globe, high-tech warfare, inefficient human transport, digital-everything, the intertubes that carry information between digital-everything, and energy-intensive food production is a road leading straight off the cliff. Of course, a transition to a low-productivity economy won’t happen by wishful thinking. It demands careful attention to incentive structures -- lower taxes on labor and higher taxes on resource consumption and pollution, for example. It calls for more than just lip service to concepts of patient-centered care and student-centered learning. It requires the dismantling of perverse productivity targets and a serious investment in skills and training. In short, avoiding the scourge of unemployment may have less to do with chasing after growth and more to do with building an economy of care, craft and culture. And in doing so, restoring the value of decent work to its rightful place at the heart of society. Virtually all bluefin tuna on the market in the United States is either farmed or caught far from the Fukushima area, so American consumers should not be affected by radiation contamination in their fish, seafood distributors say. 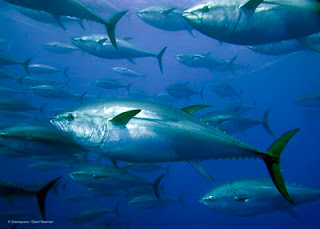 The migratory bluefin studied by the researchers were all caught by sport fishermen and were not headed for the market. "We don't think there will be any public health concern from the results of the new tests," Fisher [a marine scientist internationally known as a specialist in radiation hazards at Stony Brook University on Long Island] said, "but if we do see any higher concentrations of cesium, we will certainly alert public health agencies again." 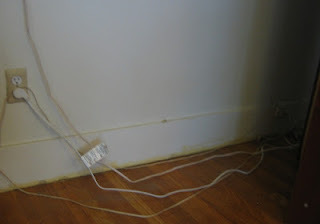 Every two to ten years, whether it's needed or not, I thoroughly dust my books and bookshelves, unloading the shelves and pulling them away from the wall to vacuum the mess of cat hair, mold, sloughed skin, and whatever the breeze blows in that accretes behind the furniture. Every two to ten years, yup. I'm just that kind of clean freak. These last couple of weeks my partner has been away (return flight: yesterday! hooray! ), and it's when I'm home alone that I tend to I grit my teeth, roll up my sleeves, bust out the duster, the vacuum cleaner, the torn-up T-shirt rags, and the Murphy's Oil Soap (tm), and do what needs to be done. 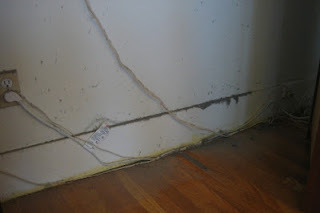 Hence the before and after photos, below, of the shelves on the south wall of our living room. Do you see the difference? Did you click to enlarge? I assure you that when I look at the shelves from my writing table across the room, the titles on the book spines look cleaner, clearer, sharper, and shinier than before I tore these shelves apart and wiped clean each one of our innumerable and, in the aggregate, unconscionably heavy books. You don't see any difference? Let's try something more graphic then. 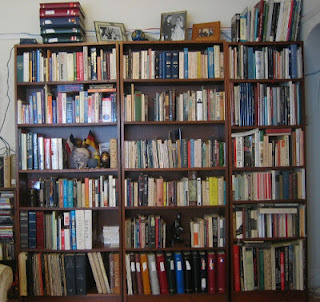 How about a peek behind the bookshelves? 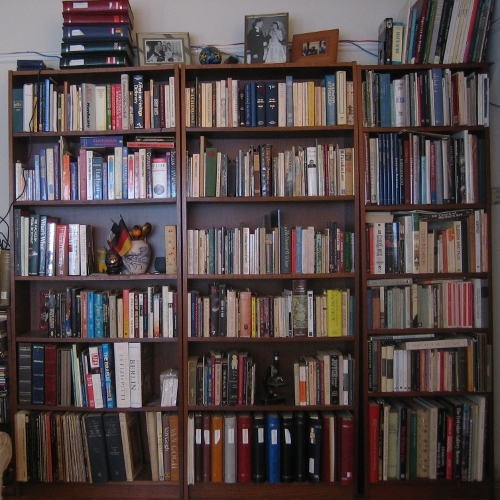 Fact #1: books and bookshelves accumulate a disgusting accretion of dust: on, over, all-around, behind. Fact #2: it takes thankless, tedious, back-wrenching labor to rid one's home of the stuff. Are these facts an argument for e-books? 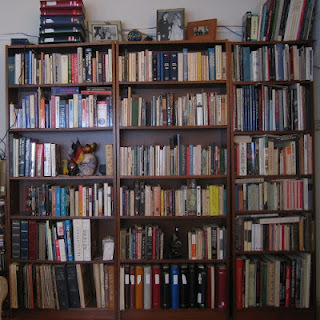 Are these facts, alternatively, an argument for my friend Bill's strategy of keeping exactly one (small) bookcase in his home, and allowing himself to accumulate only as many volumes as fit on it -- to add one more, another has to go? Or are these facts, in actual fact, an argument for the value of robotic automagical nano-vacuum-cleaners, a technology that, to the best of my knowledge, has not yet been invented? Enquiring minds wonder as they ice their lower backs. [...] they came upon Lauber, tackled him and pinned him to the ground. As Lauber, his eyes filling with tears, screamed for help, Romney repeatedly clipped his hair with a pair of scissors. The story is appalling, and multiple independent witnesses are proof the assault happened. Should we shrug our collective shoulders? It was a long time ago, and kids bully kids every day. Eighteen year olds can be idiots. We're adults, we know all that, right? Of course, there are bullies who grow up to regret their brutish behavior and atone for it; and there are bullies who remain intoxicated by power over others. The politically significant question is this: how are we to understand what his personal history as a high school bully means in relation to Mitt Romney's candidacy for President of the United States? It's all such nonsense. Even worse than the focus on an incident of bullying or drug use is the tendency in this culture to try to expand such tidbits from the past into a definitive psychoanalysis of an individual. It's a long way to November. Lest we forget, this nation has a long war and a moribund economy to fix. 3. Foreshadowing John Diaz' take quoted above, the SF Chronicle's James Temple published an interview with Jacob Kohnstamm in early May, titled Europe's more stringent view of online privacy. According to Temple, Kohnstamm is a central figure in the simmering international debate over digital privacy - and as a consistent critic of major U.S. Internet companies. Q: One of the most controversial rules in the proposals, at least on this side of the Atlantic, is the concept of a "right to be forgotten." It has the potential to grate against U.S. views about the importance of freedom of expression. What's your take on the appropriate balance? Kohnstamm: There's one basic principle that is behind the right to be forgotten: One of the most important things for human beings is that they have the right to grow older, to change their habits, to evolve and develop in different ways. The Internet makes it nearly impossible to choose other ways to live, without being confronted all the time with the previous ways you thought about things. So, fundamentally, behind the principle of a right to be forgotten is this idea that you shouldn't judge a child on its childish behavior 20 years later. 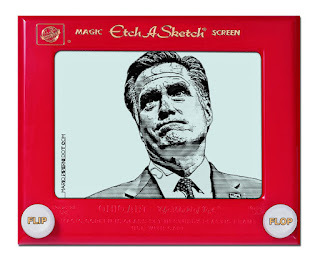 If I were looking to vote for a high school bully turned vulture capitalist turned etch-a-sketch hypocrite pandering political opportunist, I'd vote for Mitt Romney for President in November. But that's not what I'm looking for in a national leader. Fortunately, there's a better candidate for the job. Not a perfect candidate. Far from it. But better, by leagues and leagues. Thanks to Mario Piperni for permission to use his Romney on Etch-a-Sketch image. Facebook Inc. shares got off to a rocky start in what has been the most highly anticipated initial public offering in history. The stock jumped more than 10% in the first few minutes of trading. But then sellers swept into the market and that gain evaporated. "It's a total disaster because the stock is trading right at the IPO price," said Francis Gaskins, editor of IPOdesktop.com in Marina del Rey. "They didn’t want that in a million years. A traditional IPO is up 10% or 15%." Okay, maybe Mr. Gaskins was a little excited. A total disaster? Bloomberg's article on Friday's stock market topic of the month was Zuckerberg Up $100 Million As Facebook Debut Stalls. Mark Zuckerberg remains one of the 30 richest people on Earth after shares of Facebook Inc. (FB), the world’s most popular social networking company, hovered near the initial public offering price in its trading debut. The Facebook IPO was not a disaster for Mr. Zuckerberg, though if I were him I wouldn't spend a lot of time trying to squeeze through the eyes of any needles. Hmmm... I'm not much of an investor myself. On the rare occasions I've prepared to buy a few shares of stock, members of my own family have begged for advance notice so they can sell short. With that disclaimer, I'll declare I have no intention of ever buying shares of Facebook stock. 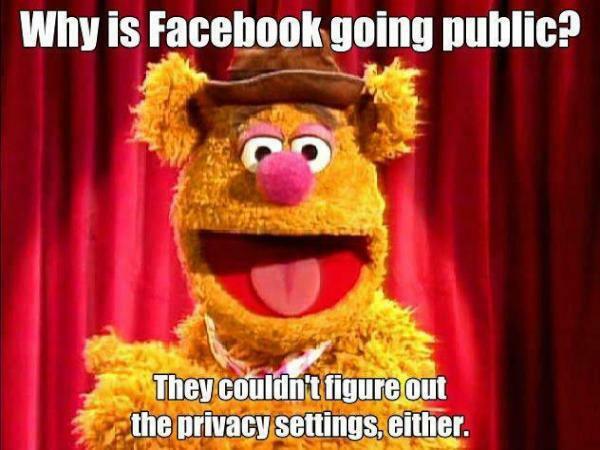 Because it's only a matter of time -- and probably not much time -- before Facebook becomes the next MySpace. Between uncertainties like those brought to public attention by writers for AP, PC World, and The Atlantic, and the ephemeral nature of 'cool', I don't see a lot of upside when it comes to Facebook, looking from the perspective of day traders or of long-term investors. Will it be quick or easy to dislodge Facebook from its dominant position in social media space? I strongly doubt it. Have you checked your Google+ feed lately? Probably not, and to note that the staff over in Larry and Sergi's shop are smart and well-funded would be something of an understatement. But it ain't over 'til it's over, and for all we know the next big social media thing may be an app that hasn't been invented yet. Facebook is valuable today because it's where 900 million people hang out. Eventually, if not sooner, whiling away the hours in the ho-hum social space where everybody else is jammed in with you is not going to be cool. 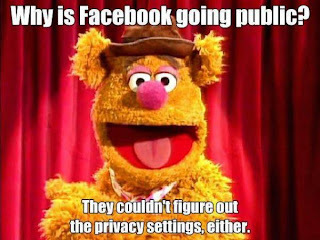 I check Facebook at least an order of magnitude more frequently than I check Google+. That's this week. Next week? I'm not placing any bets. I have a strict rule that when a book is made into a movie, you always watch the movie first and then read the book to get the fullest experience and appreciate both because reading a book of your favorite movie can be extremely fun. But I read the book before the movie came out. Whenever you watch a movie second, you hate it. But something amazing happened, I loved the movie! I stayed up two hours past my bedtime watching it! Yes, I have a bedtime. I'm pretty much with Stephanie on this bit: Whenever you watch a movie second, you hate it. In my experience, that's almost always true. But my strict rule is exactly opposed to hers. My rule is book first, movie second. 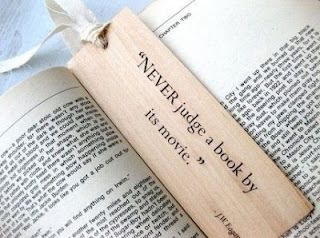 When a book is made into a movie I'll only watch the movie first if I don't expect to read the book. True confession: I saw all the Harry Potter movies, but couldn't be bothered to read the books. I hear they got better as J.K. Rowling went on, but I never got past the first chapter of Harry Potter and the Philosopher's Stone. An exception that proves the rule I follow? Kazuo Ishiguro's Never Let Me Go -- I saw the movie first in that case, but it was a mistake ... and I said so in my post about the movie and book, Dystopias in fiction. I feel deprived when I see a movie before I read the book on which it is based. If I see the movie first I don't have a chance to imagine my own vision of the author's work ... I can't shake myself free of the movie's portrayal of the story. The movie director's vision leads me to see, hear, and think of the work in the frame of her/his interpretation. When I think of the characters I see the actors who played them in the movie. When I visualize the setting I imagine from the director's and camera's point of view, inflected by the choices presented to them by a location scout. No matter how deep and rich the director's interpretation, no matter how nuanced the actors' portrayals, no matter how fine the cinematography, or how well done the lighting, the sound track, the costumes and props -- they're not what I would have imagined, given a clean slate and the author's words. One of the things I like best about reading books is the sheer alchemy of reading: from an author's words -- "black marks on white paper" as a college roommate used to tease me when I spent too many hours scribbling -- through the filter of my imagination and experience, and thus to a world. I love watching movies too ... but, in the case of movies based on books, only after I've had a chance to interact with the book's author, mind-to-page. The middle of May is among the best times of year in Berkeley, especially for those with a relationship to the UC campus here (I'm an alumnus and an employee). Sitting in a favorite cafe this weekend, just across the street from Sproul Hall, I watched a parade of begowned graduates and their loved ones enjoying a celebratory pre- or post-ceremony meal or drink. Call me a sentimental fool, but the evident pride of families and friends of the graduates makes my eyes well up. You never know in particular cases, but we who work on the campus are keenly aware that more than one in four of our undergrads are the first in their families to earn a four-year college degree. That's a big deal when those first-in-families are attending a university that stands among the most highly ranked in the nation by all manner of measures, an R1 institution whose faculty win well over a half-billion dollars in research funding year after year. Being a part of a world-class campus that each year launches thousands of smart and hard-working students into the rest of their lives is arguably the most profound reward of working at UC Berkeley. It's the reason many of us work at Cal. Even among staff who don't teach classes, what they say about teachers holds true for many, perhaps for most of us: we're not in it for the income, we're in it for the outcome. This year a member of my own family is graduating from UC Berkeley; I'll attend her department's ceremony on Friday. My first-cousin once removed -- the daughter of my first-cousin -- she is not the first in her immediate family to graduate from a four-year college ... but I'm here to tell you, in words that don't capture the half of it: she's smart, talented, and energetic. I am just about bursting with pride for this poised young woman's accomplishment, and I have it on good authority that her parents, siblings, aunts, uncles, cousins, and grandparents are too. Congratulations to every one of UC Berkeley's Class of 2012. We're counting on each and all of you to help lead the way, however uncertain, to a better world. In my own personal calendar, today is one of those anniversaries I would rather not have to observe ... but the weeks and months go by, time unspools, and there you are. It's twenty years since my mom passed away. I prefer not to fix on the date of her death as a way of remembering Bonnie Masover. I'd rather remember her birth date, or to remember her on my own birthday, or just to remember her. Here it is, ready or not, May 10th, twenty years on. I'm a couple years shy of Mom's age in 1992. Each time around the sun I become more keenly aware of how young she was when cancer won out over fierce determination to beat it. A lot of water has flowed under a lot of bridges since. She has missed much; she's been missed by many. Mom's grandchildren are eight and six years old, respectively. Though they live far enough from California that I spend time with them only rarely, I see Mom's face clearly in the photos my brother shares of a granddaughter she never met. Losing Mom shook me to my foundation; twenty years gives a bit of perspective. It's true that life goes on. I can look up from my own grief now that its sting has dulled, and see that everybody's mom dies. We all do. Kids grow up to be like their forebearers, and different too. Memory fades no matter how hard we cling to it. It's also true that feeling for those we love and lose is deeper and more particular than that sort of flat generalization. I watch the world with her eyes. She lives in my deepest and least articulate places, the parts of me that lie many fathoms beneath words, in the bedrock of my self. 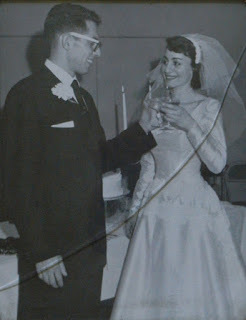 That is her, my mother, there in the bedrock on which I stand. Late last week, activist-citizens around California showed up at county offices around the state to advance an initiative that would require genetically engineered food to be labeled as ... wait for it ... genetically engineered food. Yep. You've got to sign a petition these days just to be informed of the facts. The intrepid activists showed up with more than 900,000 signatures in hand, which means there's a pretty good chance that California voters will have a chance to decide the question, yea or nay ... give or take a few years in the courts, I suppose. Is it a good thing when people have a chance to know how the food they're buying, eating, and serving their children came to be? Would it be better if people just shut up and ate whatever's on the grocery store shelf? We know now, at any rate, that at least 900,000 California voters would like to make that decision for themselves, thank you very much. “It has changed agriculture forever,” said Stanley Culpepper, a weed scientist at the University of Georgia. But some critics say the new crops will lead to a manyfold increase in use of 2,4-D and dicamba. Neither is used that much now on corn and soybeans — the two leading crops by acreage — out of fear of harming the crops. The new crops “ratchet up dependence on the use of herbicides, which is very much a treadmill,” said David A. Mortensen, a professor of crop and soil sciences at Pennsylvania State University. Scientists in Nebraska have already discovered a small amount of waterhemp — perhaps the most troublesome weed in the Corn Belt — that is resistant to 2,4-D. This isn't a new problem, and it's not only an economic issue. It's a moral issue as well. Collateral damage to the biosphere has been occurring from the dawn of industrial herbicides. And the collateral damage is severe. Savage, even. I'm going to repeat a quotation from Rachel Carson's Silent Spring (1962) that I included in a post only a few weeks ago. The passage references a campaign to wipe out the Japanese beetle in the American Midwest by massive application of insecticides. More recently, here's Dr. Elaine Ingham, of the Rodale Institute, and a former researcher at Oregon State University. The quote below is taken from her essay in Nature's Operating Instructions: The True Biotechnologies (2004). The essay is called Unnatural Selection: The Bacterium That (Almost) Ate the World. The article describes an experiment Dr. Ingham performed in the early 1990s on the potential environmental impact of genetically engineered bacterium, modified from Klebsiella planticola. The genetically modified bug was 'invented' to solve a big problem and provide significant benefits: it was meant to turn the chaff left in fields after a harvest into alcohol that could be burned constructively as fuel, as an alternative to burning plant waste in the fields after a harvest, thus releasing massive quantities of pollutants into the atmosphere. I have attended some of the United Nations biosafety protocol meetings. At the 1995 meeting in Madrid, the U.S. delegation was the strongest in saying, in essence, "Don't worry, be happy. Trust us. We don't need a biosafety protocol. Why would biotech companies ever do anything to harm people?" To me, their words echoed those we've heard before from tobacco, pesticide, and fertilizer companies. Opponents, led by an arm of the Biotechnology Industry Organization, whose members include Monsanto and Dow AgroSciences, say labeling would mislead consumers by implying that genetically engineered foods are unsafe. It's a lot of work to find your way through competing narratives, to sift information from spin. I've quoted a lot of words in this post, but they represent only snippets of the articles or books from which they are excerpted. What would motivate a person to slog through all that verbiage? The price of apathy toward public affairs is to be ruled by evil men. 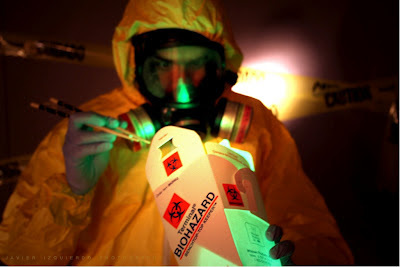 Thanks to Javier Izquierdo for permission to use his photograph in this post, and to Wikipedia for the biohazard symbol image. Raise your hand if you've ever watched Mister Rogers' Neighborhood. Is that everybody? No? Okay, for those who missed out, Mister Rogers' Neighborhood was a public television show for kids produced in Pittsburgh, Pennsylvania. It ran from 1968 through 2001, and is still shown in reruns on some stations. The eponymous Fred Rogers passed away in 2003. For younger readers who missed out, think Teletubbies, with a Presbyterian minister who wears a cardigan instead of cartoon characters with TVs embedded in their tummies. A short story I had grinding through my rewrite mill for a while -- and finally declared finished late last month -- includes incidental references to the show. In one scene, the twelve year old protagonist's little sister is watching Mr. Rogers' Neighborhood. He looks in on little Marissa entranced by the TV, and sneeringly disparages the show as "stupid." He's twelve, he's got a younger sister, what do you expect? 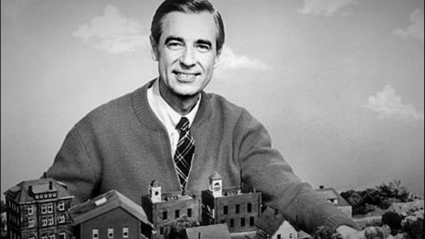 Given the impressive span of years that the show ran on public television -- 33 years in production, never mind another eleven years of reruns to-date -- the fact that Mr. Rogers' Neighborhood is on TV in a short story doesn't date the tale very precisely. Seventies, Eighties, Nineties -- the tale could easily be set in any of those decades, or later if the show were a rerun. But consider this: one of my late-draft readers, J--, assumed that because Mr. Rogers' Neighborhood is on TV on page five of the story's manuscript, it had to be set in the 1970s. Now why would she think that? I pointed out to J-- that while the show did run throughout the seventies, it also ran without interruption into the 21st century. J--, who does not have children who might have watched Mr. Rogers' Neighborhood during the years since she did, was surprised to learn this. Now I think that J--'s assumption is easy to assume. While I had in mind that the story took place in the 1990s, and there's nothing in the story that couldn't have occurred then, it's also true that there isn't much in the way of temporal precision in this particular piece. One might like to imagine the critics calling it timeless. We'll see about that. So the takeaway is that a reader, quite reasonably, projected her own personal experience of a reference in a short story onto the story itself. Because she watched Mr. Rogers' Neighborhood in the 1970s, a story in which Mr. Rogers' Neighborhood is on TV must be taking place in that decade. Q.E.D. One of the rewards of writing fiction is to hear how readers are drawn in so deeply that they inhabit the story's world. This can happen in either direction: the reader seeing her own world in the story, or the reader being transported into the story's world. Depends on the reader. And the story. Another piece of short fiction, one I'm still working on, features a couple of kids getting in way over their heads when they swim in a deep, cold quarry pool. That story recently survived a second round of critique by my writers' group. One critiquing writer said that when she finished reading it she realized that the evocation of swimming in cold water left her feeling as if she herself were "freezing." Now that's a compliment (thanks K--). Fiction might lead us to fathom our own particular universe, or draw us out to explore others. You never know where you're going to end up when you let words have their way.